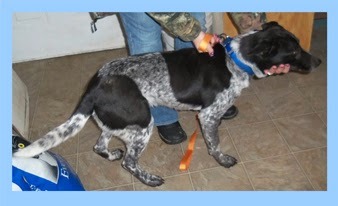 Look at the beautiful markings on this Blue Heeler. Ozzie is from one of our rural pounds in Missouri and has been there since March. At this point in time the pound is overflowing and soon some awful decisions will have to be made if some homes cannot be found. Ozzie is about seven months old and was surrendered by his owner. If you know anyone who like Ozzie, please contact Stover Animal Control through Ozzie's Petfinder page HERE. I hope this beautiful young dog can find his home. I hope he finds his forever home. Will share. Paws crossed that Ozzie finds a safe loving forever home soon! Ozzie is beautiful. My parents had a blue heeler and he was an awesome dog. I hope somebody gives him a loving home soon. I'm off to share.